In a PSAC West-versus-East showdown this past Saturday, West Chester proved to be too strong for IUP as the Golden Rams defeated them on their home field, 28-17. The Rams now await Sunday afternoon’s election show to see where they will be seeded in the national tournament, and against whom. The Brandon Monk show was back at it this week, causing havoc all over the field. Whether catching passes, running past lnebackers, or returning punts and kicks, Monk owned this game. Monk combined for 200 all-purpose yards, with 79 on the ground, 22 through the air, 80 in punt-return yards and 19 in kick return yards. Even more impressive, Monk scored three different ways. A seven-yard touchdown run early in the first quarter gave Monk his first six points, which was followed by a 13-yard catch-and-run to Monk from quarterback Sean McCartney. Monk’s last score may have been his most impressive, scoring on an 80-yard punt return in the fourth quarter. After an impressive game two weeks ago against East Stroudsburg, a Golden Rams fan could only hope to see the same productivity out of Monk for a second week in a row. After somewhat of an up and down season productivity wise, Monk could be a key to a postseason run. Well, Monk delivered, and in high fashion. As the playoffs approach, it will be Monks’ job to stay this hot through November, and carry the Rams running game on his back. Assisting Monk in the backfield, Eddie Elliot saw carries for the first time in two weeks. Elliot, who was not handed the ball off once in the backfield against ESU, ran the ball nine times this week for a strong 44 yards. Elliot will have to continue to be the second wind for the backfield if WCU wants to keep defenses on their heels all game. McCartney’s work sometimes goes unnoticed. Under the flashy play of Monk or the dominant defense, fans sometimes forget how lucky the Golden Rams are with the consistency they have behind center. McCartney has week in and week out been the rock of this offense, and this whole team. McCartney, who threw for 299 yards on 17-26 passing, has accepted his role as leader of this team and has certainly performed up to par. He doesn’t always throw the 65-yard touchdown bomb, or make the crazy “Johnny Football” like scramble plays, but he is effecient and smart, exactly what any coach wants. 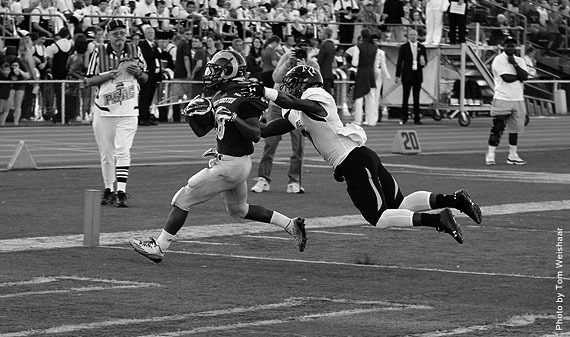 Six Golden Rams receivers caught passes Saturday afternoon, none catching more than four but none less than two. Mike Doty led all receivers with four catches, resulting in 68 yards and one touchdown from McCartney. Doty has continued to find the end zone and make plays for this Golden Rams team in the past few weeks, being one of McCartney’s best options. Tim Brown and Erick Brundidge combined for six catches and 154 yards. For the first time all season, Brown and Brundidge were kept out of the end zone in the same game, but that did not slow down West Chester. Elliot and Monk each caught two passes, while Shannon Mayer also caught three for 35 yards. On defense, Mike Labor played the game of the season, compiling a season-high 15 tackles, including two tackles for loss and a forced fumble. Labor led the charge for the stingy Golden Rams defense to hold off a strong IUP offense. Labor dominated the middle of the field from linebacker, as he often does, not allowing the Crimson Hawks to get anything going. Aiding Labor, All-American Ronell Williams secured eight tackles along with Drew Formica, who added 10 tackles of his own. Formica also recovered the forced fumble caused by Labor. The big three of Labor, Williams, and Formica played one of their best games of the season on Saturday. The defense line got down and gritty for the Rams Saturday afternoon. Andrew Cohen racked six tackles for the Rams, including a sack, while Barry Lyons added five of his own. Shaquil Ryder was not far behind with four tackles of his own in the victory. Ryder and Cohen have made their presence known since day one of training camp. Both are have their best seasons of their careers, and contributing to the Golden Rams defense in such an enormous way. Al-Hajj Shabazz led his defensive back core to another successful showing at IUP. Shabazz grabbed his team-high fourth interception on the season, broke up two passes, all while racking up six additional tackles for the Golden Rams. Assisting Shabazz, Cory Scott secured eight tackles, while Brandon Pepper contributed five of his own. The defensive backs shut down the passing game for IUP, as they have done to opposing teams and quarterbacks all season. Shabazz came alive last year in the playoffs, perhaps we will see more of that this year. The past few games, the Rams have won the battle in the trenches by a large margin. Whether looking at the defensive or offensive lines, the West Chester big men have been working extremely hard at their job, and it shows. Their success has sprung the team and added the spark the Rams needed to make a push back into the postseason. Another great regular season is now in the books for the West Chester University football program. Last year, going 10-1 seemed like an untouchable season. Now, the Rams have done it, yet again, leaving no doubt that this football program is the real deal and here to stay. Two straight extremely sucessful seasons have flown the Rams right into the conversations of one of the best division II football programs in the country. With another impressive run in the postseason a possibility, the Golden Rams will keep turning heads and making their names known among the NCAA football community. The Golden Rams fate is now in the hands of the NCAA. As the selection show is slated for Sunday, the Rams will await to see whom their first opponent will be. It is possible that West Chester could receive a first-round home game, or even possibly a first-round bye. Due to a Bloomsburg loss in the PSAC championship to Slippery Rock, the board has been shaken a bit. When Monday practice hits, no matter who their opponent is, believe the Rams will be ready to take any challenge head-on and continue to dominate opponents. Could a rematch with the rival Huskies be approaching in the near future? It is certainly very possible, as we have seen it before. Last season, after beating the Golden Rams in the PSAC semi-finals, the Huskies and Rams met again in the second round of the national tournament. West Chester got their revenge, knocking Bloomsburg out of the NCAA DII playoffs, while rolling to one of their most successful seasons of all time. This year, it is a whole new ball game. Golden Ram fans can be sure that they are in for an exciting next couple weeks, no matter who the opponent may be.